At the National Theatre box offices (Mon-Fri 9 am-6 pm, Sat-Sun 10 am-6 pm). 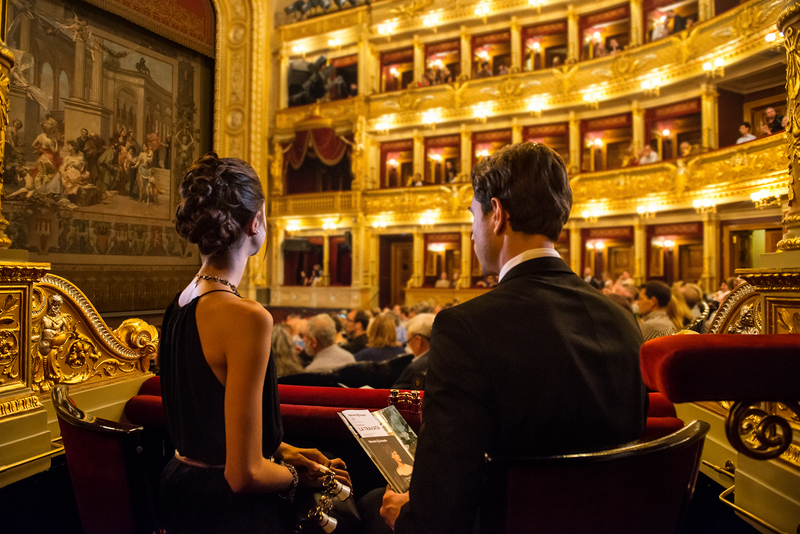 You can buy tickets for the performances of Opera, Ballet, Drama, Laterna magika at the National Theatre, the Estates Theatre and the Karlín Music Theatre. 45 minutes before the beginning of performances the box offices are open at the National Theatre historical building and the Estates Theatre. The beginnings of theatre in today’s Czech Republic date back to the 12th century, when the theatre was played in a church environment in relation to the liturgical rites of the church year (Easter and Christmas plays, the plays of feasts of saints, stories from their lives, etc.). The theatre was played at the premises of temples and monasteries, the actors were priests and religious - and also female characters were represented by men; texts were Latin. From the 13th century the influence of secular environment has been growing and in addition to the temple scenes, also more entertaining plays appear; they were played in the streets and marketplaces, but also at the court of the king Václav II. Actors were mainly religious students, but also students of home schools. The establishment of a university in the 14th century was of the great importance, the texts of plays began to be written also in Czech in addition to Latin (including original plays). In the Renaissance period lots of nobility palaces were constructed; they usually had big halls with at least two floors, which were also used for theatrical performances. However, these theatre performances were not public but were only intended only for invited guests of the Master of the House. The first theatre open for the general public was founded in Prague V Kotcích at the place of former merchant shops and in 1771 the first performance in Czech was played there – it was the translation of the originally German play called Prince Honzyk (Kníže Honzyk). In 1783 the Nostitz Theatre was opened, mainly for German drama and Italian opera. A year later the wooden Patriotic Theatre, so called Shed (Bouda), was built at Wenceslas Square and was intended exclusively for Czech performances. However, due to financial difficulties, it only was operated for 3 years and was demolished in 1789. During the 1st half of the 19th century several so-called arenas were established behind the city fortifications (mainly in the area of today’s Vinohrady and Nusle), which were especially popular during the summer – they were airier than stone theatres. In 1845 an initiative of Czech patriots established the theatre cooperative that brought request for authorization of the establishment of Czech stone theater to the Viennese government. The request has remained unanswered for the time being. In 1848 Josef Kajetán Tyl suggested organizing collections for the construction of the theatre building and in 1850 the establishment of the Commission for the establishment of the Czech National Theatre in Prague was permitted; the commission immediately issued a call to start a collections. Among the donors there were representatives of the nobility, personalities of social and cultural life, many clubs and organizations, groups of workers and employees of various factories and plants as well as thousands of individual citizens. In 1852 a plot was purchased on the bank of Vltava river but the start of the construction has been hampered by disputes between Old Czechs (F. Palacký, F. L. Rieger), who wanted to build a simpler building easier and faster built and Young Czechs (K. Sladkovský, K. H. Borovský), who advocated a more representative building with requiring higher financial costs. The dispute was resolved by a compromise that was the Provisional Theatre by the architect, Ignác Ullman opened after six months construction on 18 November 1862. It was able to accommodate 1,000 spectators and it was fully exploited up to the year 1883. In 1865 an architectural competition for the National Theatre itself was listed, in which the project by Josef Zítek, the Professor of Prague German Polytechnic School, in the northern Italian Renaissance style was awarded the first prize. On 16 May 1868 foundation stones were laid - one of which was to be originally from Říp Mountain, where it was broken off within a festive pilgrimage, but it could not be shaped into the desired shape, so that a granite stone from Louňovice near Říčany was used. On the whole 26 stones were delivered to the site (from Radhošť, Říp, Blaník, Southern Bohemia, Šumava etc., whereas four stones were from Prague: one from Žižkov, two from Vyšehrad and one from Slivenec; one of the foundation stones was donated by countrymen from America with the inscription engraved on it: What is governed by the blood, the sea will not divide).Taps on the foundation stone were started by František Palacký followed by Jan Evangelista Purkyně (as a science representative), Josef Wenzig (art), Josef Jiří Kolár (for performing arts), Bedřich Smetana (for music), Josef Zítek (architect) and others. Collections were further organized in all the Czech lands and also the Emperor Franz Joseph I contributed a significant amount. From 1873 competitions were held for the theatre decoration. The building was completed and the theatre first opened on the 11 June 1881 to honour the visit of Crown Prince Rudolf. The opening performance was the premiere of Bedřich Smetana's Libuše, which was conducted by the already deaf composer himself. Several performances were played, the theatre was closed for the summer and the finishing works continued. During these works the carelessness of construction workers who badly extinguished charcoal during their work on the roof, lead to the fire on 12 August, which destroyed the copper dome, the auditorium and stage, and also trigs were destroyed. Immediately, however, a new national collection for repair was organized. However, the reconstruction project was assigned to Josef Schulz, the student and assistant of Josef Zítek. Zítek had been wrongly blamed for neglecting fire prevention measures, so he decided to resign with bitterness. Schulz did not make any radical changes, he just lowered and reduced the roof dimensions, thereby reducing the number of seats from 1,800 to 1,360 (which was something already Zítek had tried to do, as the original requirement of the Commission was 2,500 seats). At the place of the old house next to the Provisional Theatre so-called Schulz house was built for the administration and management of the theatre - it has been the historic office of the director there till these days. On 18 November 1883 the theatre was reopened again by Libuše performance and it served with no major repairs nearly 100 years. František Adolf Šubrt was appointed its first director. 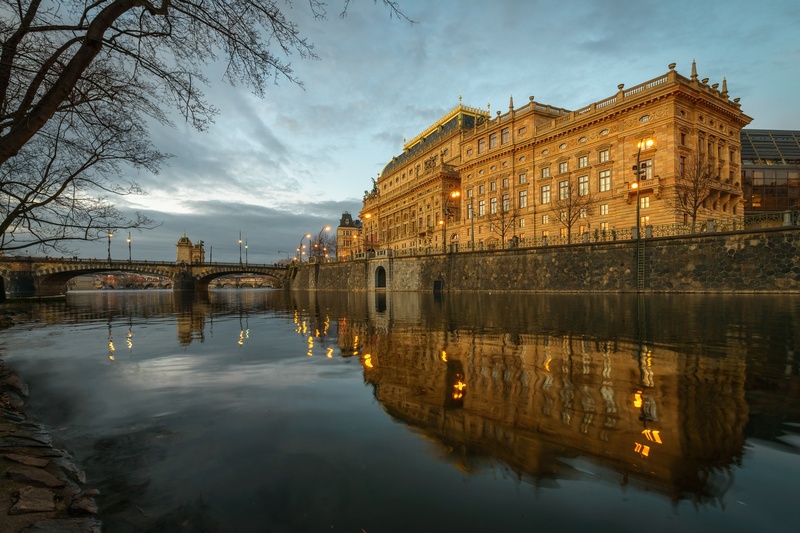 In the premises of the theatre we can find masterpieces of Czech authors of the 19th century, who are commonly called the National Theatre Generation. In the exterior the loggia stands out with Corinthian columns above the main entrance, preceded in front of the building. It bears the statues of Apollo and nine Muses by Bohuslav Schnirch. On both stair pylons there are horse trigas with goddesses of Victory, which were mounted in 1911. The original trigas by Schnirch were destroyed in a fire and consequently they were newly created by his disciples, sculptors František Rous, Emanuel Hallmann and Ladislav Šaloun. In the loggia there are lunette frescos of Five songs by Josef Tulka in Mánes concept: Poetry of gods given to the nation, Love Song, Song of piety, Song of oppressed freedom and Song of resistance. In the niches on the sides of the facade there are statues of Lumír and Záboj by Antonín Wagner. The portal to the waterfront side of the facade bears the statues of Opera and Drama by Josef Václav Myslbek, on the attic on this side there are statues by Antonín Wagner, representing Opera, Drama, Musical drama, Comedy, Poetry and History. In the interior of the theatre both on the ground floor and on the gallery floors (called cloakroom corridor), on the staircases and in both foyers we can find number of predominantly bronze busts of theatrical personalities by the best Czech sculptors - Jan Štursa, Bohumil Kafka, Karla Vobišová, Karel Opatrný, Ladislav Kofránek, Otakar Španiel, Josef Drahoňovský, Jakub Obrovský etc. (actors, singers, writers, composers, architects, painters of the National Theatre). In the first floor lunettes in front of the main foyer there are allegorical paintings by Adolf Liebscher: Ballet, Opera, Epos, Melodrama, Operetta, Comedy, Drama and Farce in which the mother figure is always surrounded by children and a variety of attributes characterizing the displayed performing arts. Below the lunettes there are 5 plaques, commemorating significant events in the history of the National Theatre, Chairman and Deputy of the Commission for the establishment of the Czech National Theatre; the central plate over the Tomáš Garrigue Masaryk bust reminds of the establishment of the Czech state in 1918. The original text mentioned the Emperor Franz Josef I, during whose reign the theatre was built. In a representative area of the main foyer, which is designed in a renaissance style and is richly coloured, there are 14 lunette Motherland themed paintings by Mikoláš Aleš - the hero travels across his home country and his life from childhood to death (The Border Guard, Tales and Stories, Domažlice, Healing Springs, Rudohoří, Northern passes, Jizera, Trutnov, Krkonoše, Dvůr Králové, Chrudim, Tábor region, Otava auriferous, Žalov).There are also four large canvases by Mikoláš Ales and František Ženíšek on Life, Myth, History and Heroic vocals themes. On the ceiling there is a triptych by Ženíšek: Decline, Resurrection and The Golden Age. In the head of the foyer there is a bronze statue called Music by Josef Václav Myslbek from 1914. Also rooms adjacent to the presidential box feature outstanding mural paintings but these premises are only rarely accessible to the public (for the first time during the open day in 2007). This part of the staircase hall is decorated with the allegories of the Czech country, Peace and History by Vojtěch Hynais. It is followed by the vestibule with a set of paintings of monuments by Julius Mařák: Říp, Radhošť, Blaník, Hostýn, Vyšehrad, Prague Castle. In the main salon there are historical compositions by Václav Brožík themed Přemyslid dynasty (with Přemysl, the Ploughman as a central character) House of Luxembourg (Karel IV. ), Habsburgs (Rudolf II.) and the allegory of Prague; in the blue women's lounge there is a cycle of the seasons by Vojtěch Hynais. In the foyer of the first Gallery there is a seven-part landscape series of sites where foundation stones were picked by Vincent Beneš and busts of other prominent personalities. This area acquired its present shape in the 1950s; originally the confectioner’s used to be here. The head of the golden red auditorium is the proscenium labelled the Nation for itself (by K. H. Borovský) spaced with crests of Czech lands (Bohemia, Moravia and Silesia). Over the inscription there is a group of sculptures in the tympanum with the figure of the goddess of victory Nike ahead, juxtaposing the crown on the heads of the Melpomene Muses (tragedy poetry) and Thalia (comedy and theatre arts) with Apollo and Dionysos behind them. In front of the stage there was originally a curtain by František Ženíšek, which was destroyed by fire. Ženíšek was asked to create it again, but he was too busy, so that Vojtěch Hynais, was approached, who was academically residing in Paris at that time, so was already influenced by French Impressionism, which was reflected in the form of a curtain. On it a temple under construction is depicted - a symbol of emerging theatre, to which painters, sculptors, builders, architects and craftsmen come from the left. Above there is a winged genius of art - other interpretations suggest that it is the Mother Motherland – having the laurel wreath in one hand and the white flag in another one. The characters are full of life and have faces of many friends of the creator: painters Marold and Rex, actresses Sklenářová-Malá, Bittnerová, Šamberková, Kvapilová, etc. Above the girl in the pink dress there is the Hynais self-portrait. The figures on the right represent donors as well as artists and architects of the National Theatre. In the middle of the edge of the curtain there are signs of Jan Žižka and Jiří z Poděbrad and signs of 13 Czech regions according to the official division of 1854. The curtain has a width of 12.2 and height of 11.7 m and it weighs 270 kg. In front of the Hynais Curtain there is an iron fire curtain, now decorated with a copy of the original decorated by the painter František Kysela. It weighs 12 tons is over 12 m high and wide and its thickness is 15 cm. The ceiling is decorated with eight Ženíšek allegories of the arts (Dance, Mime, Poetry, Lyrics, Epic, Music, Painting, Sculpture and Architecture). It is oil on canvas, ready-installed on the ceiling. In the middle there is a chandelier made according to the project by Josef Zítek in Mainz. The original was destroyed in a fire and commemorative medals were minted from the molten materials and were sold in favour of repairing the ruined theatre. The newly made chandelier is an exact copy of the original, was made of cast bronze and gilded. It has eight rings with 208 bulbs and 16 halogens hidden in the ceiling, which enlighten the canvas by Ženíšek. It is 5.5 meters tall, has a diameter of 3 m and the total weight is nearly 2 tons. The National Theatre was one of the first theatre buildings in Europe, which was lighted electrically. The building before the fire was lighted by gas and the electricity was introduced after the fire by František Křižík company. The completion has been under consideration since the 1950s – at that time neighbouring Kaur's houses were demolished. The project was developed by Brno architect Bohuslav Fuchs, and the construction works began in 1970s according to his project with only few changes. However, in 1981, the supreme government authorities assigned the work to Project Institute of the Capital City of Prague (Projektový ústav hlavního města Prahy) and the project was changed according to the project by architect Karel Prager, which mostly affected the appearance of New Stage of the National Theatre. The New Stage is connected with the so called restaurant building (Club of Actors, restaurant and cafe) and the restaurant building is connected with the administrative and operational premises (actor’s dressing rooms, meeting room, a large testing room and five-storey basement for technical facilities). From 1 April 1977 a general reconstruction of historic building took place under the supervision of ing. Arch. Zdeněk Vávra and whose general designer was National Institute for the Reconstruction of Historical Towns and Buildings SÚRPMO (Státní ústav pro rekonstrukce památkových měst a objektů) as a general developer. The historic building was strictly maintained both in exterior and interior, except partial adjustments to adjacent premises. The entire operation part of the building, i.e. the Provisional Theatre and Schulz House were pulled down and radically rebuilt. Only the rear vestibule, theatre producer’s room and staircase have been maintained. Otherwise, new structures were built in the outer walls including a roof structure to maintain the silhouette of both buildings. Two testing rooms (ballet and universal) as well as other technical premises were built. The art decoration was enriched with works by contemporary artists. In the new changing room in the basement (which is used for the ground floor and the 1st and 2nd balcony) there are chandeliers, designed by the architect Zdeněk Vávra, Vladimír Gleich and Věra Lišková. At the entrances to the changing rooms there are (opposite to each other) busts of Josef Zítek by Marta Jirásková and of Josef Schulz by Emanuel Hallman. In the cafeterias there are paintings with theatrical themes by Karel Souček, František Jiroudek and Stanislav Ježek, whereas in the smoking room there are bronze vases by Jiří Kryštůfek. About 3 kg of gold have been used for the decoration of exteriors and interiors, which is why the theatre is sometimes called the "Golden Chapel". However, in areas of higher abrasion the soft gold had to be replaced with so called metal with higher durability, which is indistinguishable from gold. Since the last reconstruction there have been 986 seats in the auditorium whereas the standing room was cancelled. After the reconstruction the theatre was inaugurated on 18 November 1983 with Smetana's Libuše. On 18 November 2008 at the occasion of the 125th anniversary of the grand opening of the National Theatre as well as on the occasion of the completion of the first phase of necessary building repairs the National Theatre held a festive day, when the building was opened to the general public; on this occasion the bust of Gustav Schmoranz, the theatre director from 1900 to 1922 was also unveiled. The building structure consists of the steel frame with special glass blocks externally mounted locks onto special cams and the interior consists of laminated panels lined with green Cuban marble. The used materials and the method of construction also addressed the elimination of noise coming from Národní třída. The auditorium can be adapted to the proscenium stage, Elizabethan stage or arena for 400 to 550 spectators. The National Theatre is a national cultural monument.